Choosing the right type of formula can be difficult and sometimes you might have to go through several before finding the right one, especially for those mothers whose babies are suffering from gas. When a child is born into the world they are very vulnerable and need to be looked after with great care and attention. A mother that supplements with good formula is ideal, especially when needs must, and there is a large range of great brands to choose from with years of experience to be able to provide your child with the best ingredients and nutritional valuable content. Powder or Formula – Some parents prefer a specific type, possibly because of convenience or that their child prefers one over the other. The powder comes in as it sounds and formula comes in bottles and pre-packaged which can be used instantly, but usually more expensive. Nutritional Value Content – Protein and Carbohydrates are the foundation for good formula and finding the balance is important if they are to maintain healthy development. Too much protein, for example, can cause issues with weight and too little causes stagnation, so by following recommended guidelines for age etc you with be less likely to encounter problems. Price – Some brands and types are more expensive but by making sure you buy in bulk can reduce costs over the long run. By making up your formula is another way to reduce costs also. The weight of your Child – Make sure to match the weight with the amount and type of formula. Age of your Baby – Feeding formula to a 0-6 months old baby is different from a 3-year-old and by following the manufacturing guidelines there will be fewer problems along the way. Sometimes mothers find they cannot produce enough milk and therefore supplement with formula and finding the balance can be challenging, but with guidance it’s possible. Formula Ingredients – Sometimes the HYPE about what is a good formula and what is not can make things confusing, but as a general rule omega-3 (DHA) and Omega-6 (ARA)are important fatty acids that can be found naturally occurring in foods, which help with their brain and overall development. These are found in foods like salmon and fishy-foods. The ISSUE arises when the mix of hexane and formula come together which is toxic and although the manufacturers state only tiny amounts are in the formula this is worth noting and being aware of. Allergies – These can sometimes be hereditary and if something runs in the family be aware not to use when choosing the right formula. Iron Fortified – Babies under 1 should have iron infused into the formula to ensure healthy growth. Availability – Changing formula too often isn’t advisable and make sure to try and stick to the one your child likes best and is settled with, otherwise it can cause digestive problems. The reasons for why they get gassy is now clear, but for thousands of years, it wasn’t (thank goodness for technological advancements). In this review I will look into some of the possible questions a parent might have in relation to their gassy infant and try to come up with both solutions and products that can assist in easing their uncomfortable baby, because I know what it’s like to have a screaming kid that only knows how to tell you they’re uncomfortable in the form of a scream. 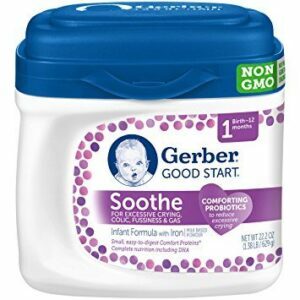 This non-GMO Gerber good start formula is for crying and fussy babies who struggle with gas and need some formula to help relieve their discomfort. This has been proven to reduce upset babies by 50% and is ideal for those in the first 12-month stage of their life. This Gerber helps with your baby’s digestive system and the probiotics help start the healthy bacteria build-up. The colic can get irritated and needs assistance and Gerber probiotic L reuteri has been found to soothe and reduce the crying in babies by 50%. This formula understands that babies for the first time use their stomachs (digestive tract) and the shock can be difficult for them to manage, that is why Gerber good start have engineered this formula to gentle ease their tummies to ensure they get all the vital nutrients without being too intense for the change in digestive processing. The rich blend of protein, carbohydrates, and fatty acids helps them get all the essential brain development nutrients to assist them to reach their next stage of being a toddler. The DHA in Gerber is similar to the type in the mother’s breast milk and helps with eye development too. The protein is designed to assist with stool development and make passing them easier. This formula is great and proven to be so, although never as good as breast milk it is an alternative for those mothers in need of a good supplement to ensure their child development through those important early beginnings. Seeing a child in pain is never nice and having a solution, although smelly, is great and usually with this product 48 hours later the signs of change-to-come is evident. This formula has been studied and is LGG trademarked. The design of the product is to help build up a tolerance to cow’s milk and the pro-biotic properties have additional benefits in making this happen. 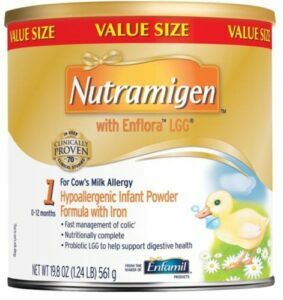 Some babies struggle with milk and need allergy management assistance and this “Nutramigen” helps with the first year’s development. The proteins in this formula are hypoallergenic, easy to digest due to them being already broken-down, which is essential. Some babies have reflux and are milk sensitive, so finding a balance between these needs are tricky and personally, I have seen the problems and stresses of an unhappy infant can cause on you and family. I have had many friends go through this and although been lucky in general myself, the need for assistance is great sometimes. This, when introduced, helps clear a blockage and although the process of clearing that smell isn’t wonderful in its own right the relief seen on those gassy babies faces is worth all the unpleasant smells in the world. This formula is designed to be an alternative for babies who are struggling to ingest milk-based nutrition. The formula which is lactose-free and milk-free in general cater for those gassy babies who might be struggling with sensitive stomachs. This is plant-protein is a complete protein for the babies that need a high-grade formula to ensure the full development of 0-12 months. Some babies for whatever the reason struggle with formula and others need for reasons like kosher requirements or have parents who follow a vegetarian diet, but whatever the reason this is a good choice. I have many friends who have different faith traditions and them having an alternative is essential, which ensures whatever the circumstances the infant with an unpleasant gas can get what they need without causing moral or ethical dilemmas. Babies that are prone to lactose intolerances can find this a great solace and relief and will thank you from the depths of their bottoms, although not usually the way would like to be thanked it will make things easier for you and whole family when they crying subsides and peace is restored. Gentlease is designed by Enfamil and is specifically for fussy and gassy babies who are struggling to digest and have troubles with gas. This product comes highly recommended and is meant be ideal in terms of gassy-baby reduction by pediatricians. The proteins have been broken down to help with digestion and help sensitive tummies. The nutrients inside are choline and others like DHA, which is good for brain development overall. There have been several studies showing that gentlease has reduced the discomfort in gassy babies and help with overall well-being. Another formula by Enfamil and non-GMO for those mothers that are concerned by such things that might affect their baby in the longer term. The ethical non-GMO is preferred by some and is an option with this Gentlease Enfamil type. This is really easy to digest formula and the taste seems to go down well with newborns and although they might occasionally bring it back up I don’t take it as a sign of dislike. The protein is an advanced protein and has been broken down to ensure that the infant can digest without having problems. 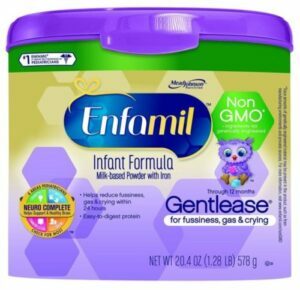 There have been suggestions that the “Enfamil Gentlease” has the ability to help foster learning all the way until 5 years of age, which is done through an advanced rich nutrients base, such as choline and DHA. A friend recommended this at a small gathering last week and said she is using this for her 3-year-old, which seems to get benefits even up until now. Other reasons could be due to the mother’s eating habits and when the child suckles the breast milk carry-on effect can cause gas. Other things like vegetables such as; broccoli, onions, and Brussel-sprouts can be gas producing in your newborn via you. Some personal experiences that seem to be shared by others are fruit juice, which can also cause babies to gas. Babies, unfortunately, can’t explain that they have a sore stomach and really need to pass some gas, so it’s our job to do the interpreting and be a super-mom! A process of elimination is always a good idea and getting to know the nuances of your baby’s patterns and cycles is crucial, it’ll set up a healthy pattern through all the years to come and set you in good stead. Babies are little eating machines and spend most of their early life doing just that, and so, it shouldn’t be a surprise that they are going to gas loads and that’s perfectly normal and a good sign, however, if your finding that they are not passing wind and struggling with discomfort, even after all the previous techniques above have been tried, then maybe some below will help. The “Gerber good start formula” is, in my opinion, the best and most mothers would agree too, it’s fast acting, easy to digest and makes for a happy baby. The non-GMO is a huge bonus for those worried about what the implication of this is. These rich nutrients are some of the best on the market and the fully cater for the vast ages range, all the way until 5 some say. 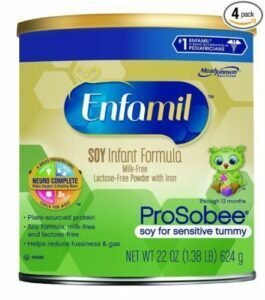 The gas that usually clogs your babies belly and makes them sore will easily pass with Enfamil, it’s a well know brand and has been around for many years continually proving themselves leaders in baby formula.